We know the world of dental insurance benefits, deductibles, co‐pays, etc. can be difficult to navigate. That’s why the team here at Brookside Dental is always ready to answer questions to help you understand your options. 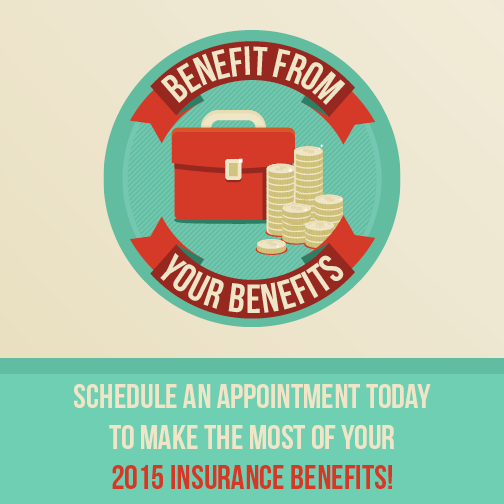 It’s important for you to make your benefits work for you! That’s why we want to remind our Bellevue dental patients to use their 2015 dental insurance benefits before they disappear! Most insurance plans will reset on January 1, 2016. You could save hundreds of dollars by taking advantage of your remaining benefits before the year ends! 2. Preventive appointments, including exams, cleanings, and x‐rays, are typically covered in full. Did you visit Bellevue dentist, Dr. Pauley, twice this year? If not, call now to schedule another cleaning before the year‐end deadline (and remember to schedule cleanings for your family members as well)! You’ve already paid for these valuable visits, don’t miss out! As always, if you need any assistance navigating your dental insurance benefits, we’re happy to help out. Call us now at (425)-643-2818 with any questions and to book appointments for you and your family and take advantage of your benefits before they disappear. Our schedule fills up fast around the end of the year, so don’t delay! Family Dentist Orange CA, Thank you for visiting our blog. We appreciate your comment about dental insurance and children.